Hodge was one of 21 players whose only first team games for Argyle were in the Football League South season and who usually played in local football or for the Armed Forces. Born in Plymouth, he began his football as an outside-right with Truro City, Greenwaves, Halls Engineers and Pearn Bros in the Plymouth & District League, prior to signing for Argyle from St Austell in 1933. Without breaking into the Home Park first team he moved on to Bristol City in 1934, scoring eight times in 62 appearances before joining Luton Town, where he chalked up another 20 appearances. From 1937 he spent two seasons with non-league Colchester United, becoming the first to make 100 starts for the club and scoring an impressive 42 goals in his total of 111 games. In the summer of 1939 he headed for Hereford, but when war was declared that September, he returned home to work in Devonport Dockyard. He played for a variety of local sides whilst serving in the dockyard, including the Devonport Dockyard team, the Royal Naval Torpedo Depot (with whom he broke a leg), Plymouth City and Plymouth United. There is also a suggestion that he played for Chelmsford City for a spell in 1941; perhaps he was seconded to the extensive light-engineering facilities there. Hodge finally got a second chance at Home Park over a decade after his first when he signed from Plymouth United, registering with the Football League on 26th November 1945. He played three times but never on a winning side, in what was a wretched season for the club. He also appeared once as a wartime guest for Torquay United that season. 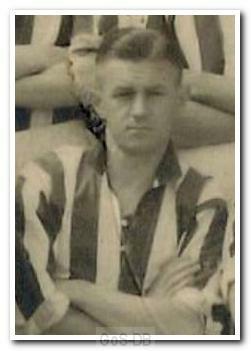 Footnote: The photo, thanks to Graeson Laitt at www.coludata.co.uk, shows Hodge in Colchester United's 1937-38 team photo.